With special co-host Camie Chance, Kenny B takes you back to Ip Man director Wilson Yip’s humble beginnings, where he made… a zombie-movie?! Hong Kong’s rare dip into the genres comes in the form of Bio Zombie. 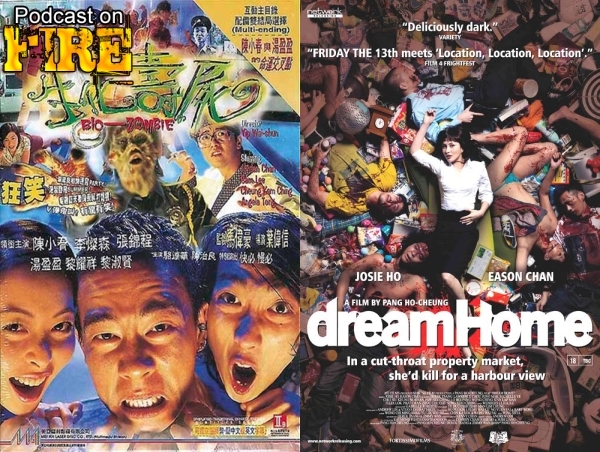 Also in the second half, despite Stoo and crew having covered the movie before, we discuss Pang Ho-cheung’s holy crap is it gory/social commentary/black comedy Dream Home. Plot: Woody Invincible (Jordan Chan) and his mate Crazy Bee (Sam Lee) are two triad lackey’s who run a bootleg VCD shop in a shopping centre. When picking up their bosses car from the mechanics they accidentally run over a man with a briefcase. When they check to see if the man is alright he plea’s for a soft drink, they find a bottle of juice by his briefcase and give the dying man his last request. Thinking that their thirst quenched buddy has passed on they decide to chuck him in the boot and get back to work. When trying to make some extra money to pay off their debt’s they decide to steal the dead man’s phone and mug one of the workers at the beauty salon (also stationed in the shopping mall). The beautician, Rolls (Angela Tong) has a hunch that it was Woody and Bee that attacked her so she and her friend Jelly decides to treat the fella’s to some Saki and see if they could coax and answer out of both of them. Plot: When school students; Ho-Nam (Nicholas Tse), Pau-Pan (Tsui Ka-Ho) and Chow-Pan (Benjamin Yuen) are kicked out school and are constantly being bullied by the local triad gangs, they have no choice to join them. The gangs friend Chicken (Sam Lee) introduces them to Brother Bee (Ng Chi-Hung), a nobale and resecpted member of the Hung Hing. The boys are then introduced to the glorious sights of the underworld, going to night clubs, massage parlours and bath houses. All these things can’t last though Brother Bee decides to test the new blood by having them attack a rival gang leader – Bill. After carefully planning the attack out, the boys enjoy up having to attack the gang leader with bamboo canes rather than the much preferred ‘Triad Choppers’, after taking a few good stabs at Bill they final manage to kill him, but their luck turns against them when members of his ‘Tung Sing’ gang are waiting for Ho-Nam.